to the substrate; as a result of which they are usually more stable. Additionally, the grids of foil gauges can be made much smaller and there is almost unlimited freedom of grid configuration, solder tab arrangement, multiple grid configuration, etc. Figure 6.8 shows but a few of the many types and size of gauge which are available. So vast is the available range that it is difficult to foresee any situation for which there is no gauge suitable. Most manufacturers' catalogues'13' give full information on gauge selection, and any detailed treatment would be out of context in this section. Essentially, the choice of a suitable gauge incorporates consideration of physical size and form, resistance and sensitivity, operating temperature, temperature compensation, strain limits, flexibility of the gauge backing (and hence relative stiffness) and cost. Unfortunately, in addition to strain, other factors affect the resistance of a strain gauge, the major one being temperature change. 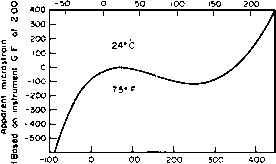 It can be shown that temperature change of only a few degrees completely dwarfs any readings due to the typical strains encountered in engineering applications. Thus it is vitally important that any temperature effects should be cancelled out, leaving only the mechanical strain required. This is achieved either by using the conventional dummy gauge, half-bridge, system noted earlier, or, alternatively, by the use of self-temperature-compensated gauges. 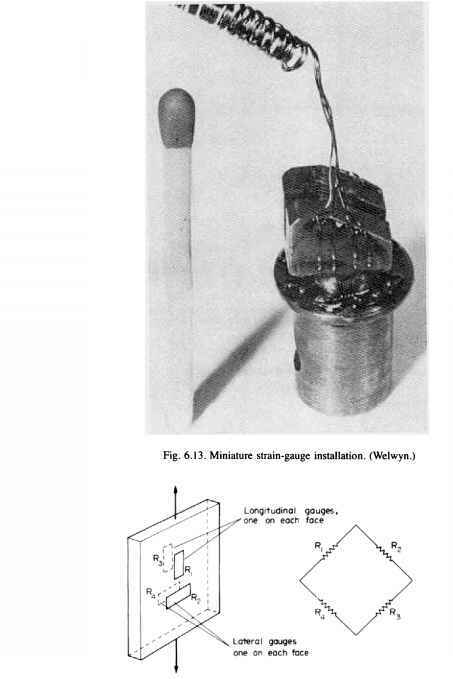 These are gauges constructed from material which has been subjected to particular metallurgical processes and which produce very small (and calibrated) thermal output over a specified range of temperature when bonded onto the material for which the gauge has been specifically designed (see Fig. 6.9). In addition to the gauges, the lead-wire system must also be compensated, and it is normal practice to use the three-lead-wire system shown in Fig. 6.10. In this technique, two of the leads are in opposite arms of the bridge so that their resistance cancels, and the third lead, being in series with the power supply, does not influence the bridge balance. All leads must be of equal length and wound tightly together so that they experience the same temperature conditions. Fig. 6.10. Three-lead wire system for half-bridge (dummy-active) operation. In applications where a single self-temperature-compensated gauge is used in a quarter-bridge arrangement the three-wire circuit becomes that shown in Fig. 6.11. Again, only one of the current-carrying lead-wires is in series with the active strain gauge, the other is in series with the bridge completion resistor (occasionally still referred to as a "dummy") in the adjacent arm of the bridge. 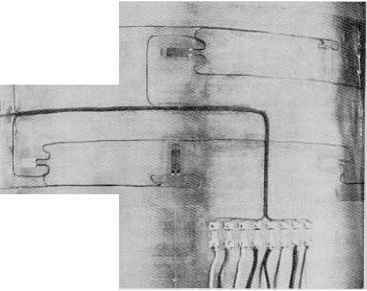 The third wire, connected to the lower solder tab of the active gauge, carries essentially no current but acts simply as a voltage-sensing lead. Provided the two lead-wires (resistance Rl) are of the same size and length and maintained at the same temperature (i.e. kept physically close to each other) then any resistance changes due to temperature will cancel. Fig. 6.11. Three-lead-wire system for quarter-bridge operation with single self-temperature-compensated gauge. recording measurements. Techniques for protection of gauge installations are also covered. Typical strain-gauge installations are shown in Figs. 6.12 and 6.13. The standard procedure for the measurement of tensile or compressive direct strains utilises the full-bridge circuit of Fig. 6.14 in which not only are the effects of any bending eliminated but the sensitivity is increased by a factor of 2.6 over that which would be achieved using a single linear gauge. Bearing in mind the balance requirement of the Wheatstone bridge, i.e. R\, R^ = R2Ra, each pair of gauges on either side of the equation will have an additive effect if their signs are similar or will cancel if opposite. Thus the opposite signs produced by bending cancel on both pairs whilst the similar signs of the direct strains are additive. The value 2.6 arises from twice the applied axial strain (Ri and R3) plus twice the Poisson's ratio strain (R2 and R4), assuming v — 0.3. The latter is compressive, i.e. negative, on the opposite side of the bridge from R\ and R3, and hence is an added signal to that of R\ and R3. achieved with a single-linear gauge. Alternatively, it is possible to utilise again the Poisson strains as in §6.9(a) by bonding additional lateral gauges (i.e. perpendicular to the other gauges) on each surface and using a full-bridge circuit to achieve a sensitivity of 2.6. In this case, however, gauges R2 and R4 would be interchanged from the arrangement shown in Fig. 6.14 and would appear as in Fig. 6.15(b). that of a single active gauge, (b) Determination of bending strains independent of end loads: "full-bridge"
It has been shown that pure torsion produces direct stresses on planes at 45° to the shaft axis - one set tensile, the other compressive. Measurements of torque or shear stress using strain-gauge techniques therefore utilise gauges bonded at 45° to the axis in order to record the direct strains. Again, it is convenient to use a wiring system which automatically cancels unwanted signals, i.e. in this case the signals arising due to unwanted direct or bending strains which may be present. Once again, a full-bridge system is used and a sensitivity of four times that of a single gauge is achieved (Fig. 6.16). Fig. 6.16. Torque measurement using full-bridge circuit-sensitivity four times that of a single active gauge. The basic Wheatstone bridge circuit shown in all preceding diagrams is capable of using either a direct current (d.c.) or an alternating current (a.c.) source; Fig. 6.6, for example, shows the circuit excited by means of a standard battery (d.c.) source. Figure 6.17, however, shows a typical arrangement for a so-called a.c. carrier frequency system, the main advantage of this being that all unwanted signals such as noise are eliminated and a stable signal of gauge output is produced. The relative merits and disadvantages of the two types of system are outside the scope of this section but may be found in any standard reference text (refs. 4, 6, 7 and 13).